Elsewhere is a haunting play of political persuasion that was performed at the Centaur Theatre, in collaboration with Imago Theatre and Odd Stumble. 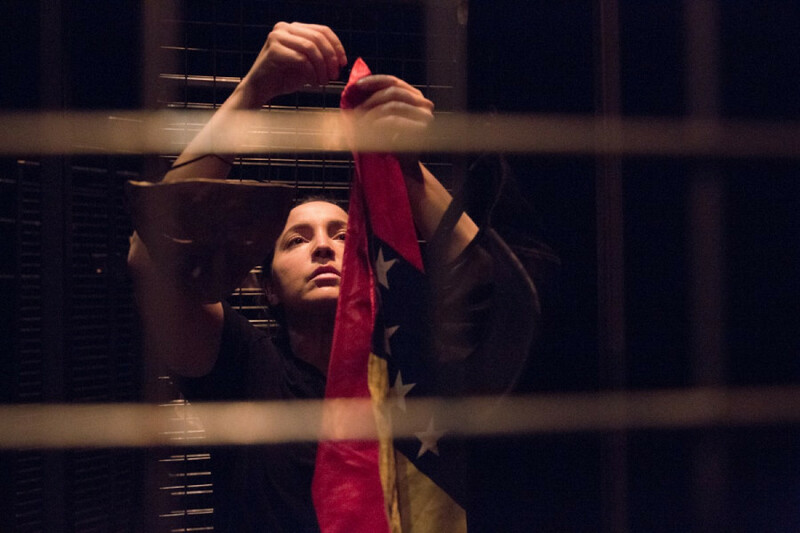 At the heart of Elsewhere is an engaging show set as a series of fourth-wall-breaking monologues about the current political situation in Venezuela. The play is uniquely performed by a sole actor, the co-creator Joy Ross-Jones, who breathes into life six different characters through various masks and props. The transformations occur in front of us, with new music played for each character while they are onstage. The show is staged within a backdrop of a series of thin and tall vertical metallic frames that are dispersed as if appearing in a crescendo of a falling dominos. Personal items on the frames, like a cap, a Venezuelan flag, sunglasses and shaggy clothing represent the six characters. Like dominos, these individuals lives are also falling apart with the deterioration of the country. Venezuela has been in a perilous state of affairs since 2013 as the global price of oil crashed. In the ensuing years, Venezuela’s economic situation has dramatically worsened, plunging to further lows of hyperinflation, scarcity, political repression, poverty, censorship and mass-protest. Elsewhere doesn’t attempt to offer a solution for the ills plaguing Venezuela, nor does it criticize the Venezuelan government; it gives us a brief glimpse into the lives of everyday Venezuelan citizens. We get to meet a police officer, a mother and former beauty queen, a homeless man, a grandmother, a rioter and a Venezuelan speaking to us from Canada. When we first encounter the Venezuelan-Canadian character she who conveys her sense of grief at being distanced from her roots. She speaks to us directly—breaking the fourth wall—expressing her anger at the apathy surrounding the Venezuelan crisis. We also encounter a mother and former beauty queen who tells us of how things were and how they are now. In a country that is globally renowned for its dominance in beauty pageants, the hyper-feminine former beauty queen is an ubiquitous archetype. We later meet the policeman character and a grandmother, the abuela. They’re both facing hardships, we’re told. The abuela tells us of her youth in Venezuela, of how she moved to the capital, Caracas, when she was only a young girl. She recounts of her youth making dresses for beauty queens and with nostalgic for the Venezuela of the 50s and 60s. She then tells us of waiting for hours in lines to buy basic necessities, but still being unable to finally procure those goods, as food ran dry. We also meet a homeless man who is lonely and frail. He feels left behind, representing the vulnerability in Venezuela’s population. In the context of the vertical metallic frames representing falling dominoes, his is the subsequent domino in line to fall. Interspersed within the monologues is a teenage protester—who we sporadically see him rioting. At one point, he yells out “Mom, today I went out to defend Venezuela. If I do not come back, I went with her,” a slogan painted on the back of a protester famously photographed protesting against the Venezuelan government in 2017. 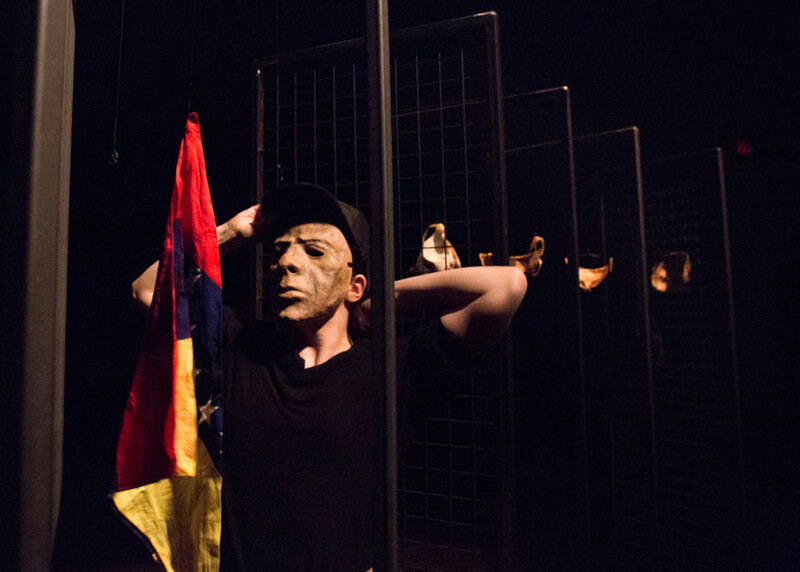 The play revolves around these characters, and their varying emotions demonstrated throughout the play reflect how they are each affected by the socioeconomic conditions of Venezuela. The homeless man is particularly affected by the crisis, however the Venezuelan-Canadian living in Canada is materially insulated from the crisis. In the series of falling dominoes; the homeless man is next in line to fall and the Venezuelan-Canadian is at very end of the domino effect–definitively the last to fall. Elsewhere was an enjoyable affair that was both educational and entertaining. The uniqueness of having a single performer portray six different roles and their breaking of the fourth wall to tell their stories was a novel idea. The actress Ross-Jones shows remarkable dexterity in being able to portray various characters, whether they are old or young, hyper-feminine, defiantly masculine, nostalgically lost, rash or overrun by emotion, to being frail and meek. Ross-Jones, the co-creator and performer, spoke after the show and mentioned her misery, grief and frustration that came with wanting to provide a voice to unspoken tragedies in Venezuela. I can say that on a personal level, I felt more connected to the crisis in Venezuela afterwards, and it left me with a perspective of what so many other survivors of crises must feel and the immigrants hailing from them.